Need to prepare for divorce? First off, on a personal note, I’m sorry to hear that. I have been through divorce myself; it is no fun for anybody, and to be frank, it can be very expensive if you’re not careful. FinancialRx’s goal is to protect your financial health and happiness, so we have prepared a checklist of 8 things you must do from a financial perspective to prepare for divorce. This is not an exhaustive inventory, but rather a list of must-do items that will help you to avoid some common things people forget and mistakes they make that can cost them a lot of money. This will be nearly impossible because divorce is, by nature, an emotional event. But to the extent you can, try to detach yourself emotionally from all of the financial decisions you are about to make about the dissolution of your marriage. Before you got married, you were a financially independent entity. You will be again. This also means you should consider selling your house. I know, you may be attached to your house, especially if you have raised children in it. But one of the biggest mistakes that women make as they prepare for divorce is they get very emotional about their house and they insist on keeping it. Then they slowly realize they can’t keep up with the payments and maintenance and end up having to sell it later, often in a much less desirable financial situation. Besides, if you sell your house, you can move to a new, neutral location that is not filled with memories of your ex, and get a healthy new start. 2. Open up individual bank account and credit card accounts, if you do not already have these. This is particularly important to do right now, before the divorce is final, especially if you haven’t had your own credit card in awhile. 3. 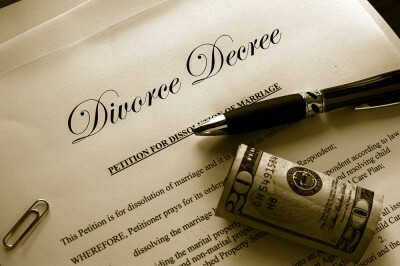 Consider alternatives to divorcelawyers. If your divorce is a fairly simple one, meaning your assets are limited and you don’t have children, or you can work out joint custody, you may be able to save thousands of dollars on legal fees by using mediation or legal document services such as legalzoom.com or WethePeopleUSA.com. If your fight is going to be a nasty one, absolutely hire a really good lawyer and fight for what you deserve! But if you and your ex can agree on how to divide your property and how to manage your children, you can file what is called an uncontested divorce. Then you can use a document service (there are plenty out there, I just listed two examples) and you can finalize a divorce for a few hundred dollars. That’s about the equivalent of what most lawyers will charge you for a single hour of their time. You might share that little tidbit with your ex before he decides to get nasty. 4. Get a copy of your credit reports. A really important thing to remember is that there are three credit reporting agencies and their reports often don’t agree. They are: Exquifax, Experian and TransUnion. There are many ways to receive free credit reports online from all three agencies, but many of these “free” online sites will then sign you up for a service that begins after some trial period like 30 days if you don’t cancel the subscription you just unwittingly signed up for. Just be watchful when you request your report that you are not signing up for a service that will end up costing you $60 a year or some other such fee. Once you download all three reports, look through every single entry and highlight any discrepancies you see. You will need to call each agency, one at a time, and work with them to fix those highlighted errors that are damaging to your credit. It is important to do this now, as you are about to step out on your own, as an independent financial entity. You will be relying on your own credit score to secure future credit for anything from new credit cards (as in step 2 above) to a loan for a new car or even a mortgage for a new house someday. 5. Close your joint credit cards accounts. This is very important – you don’t want him to be running up debt on your joint cards and then leave you holding the bag. Then of course you still have to pay them off after they are closed. This is the tricky part because you must negotiate with your ex and get him to pay off his half of the debt on each of these joint cards. The best way to accomplish this is for each of you to write a check to the joint credit card account from your new individual checking accounts. Depending on how high the balance is, this may take awhile, but stay on him until each card is paid off. Then check your credit reports again and make sure every single joint card has been reported as “closed by the customer.” Whew! 6. Figure out your health insurance. If you had your own coverage, through your employer or through your own business, then you are set and can skip this step. But if you receive your health insurance through your husband’s employer, you are about to be cut off and need to shore up coverage for yourself and especially for your kids ASAP. Do not fool around with this. According to a study published by the American Journal of Medicine, 62% of all personal bankruptcies filed in the US in 2007 were related to excessive medical bills. Not brutal enough? Ok, one night in a typical US hospital averages about $9,000. Insurance is expensive, yes. But being uninsured can expose you and your family to the real threat of long-term financial ruin. Ok, now I will step off my soapbox and help you with what to do. First, elect COBRA via your ex-husband’s employer. COBRA is just a fancy acronym that stands for a law passed by Congress in 1986 that allows people to stay on the group health insurance plan that would otherwise be terminated – generally via termination of employment, divorce, separation, etc. COBRA health insurance an seem expensive, but what you’re paying is really just about 2% more than what your ex’s employer used to pay for your plan on your behalf. The way you elect COBRA health insurance is to contact your ex’s place of employment and ask to be connected to the COBRA plan administrator. You have 60 days after the COBRA “qualifying event,” which is your divorce, to do this, so get on it, sister. You can remain on your ex’s COBRA coverage for up to 18 months, which will go by quickly. This means that you will either need to get coverage through your own employer or shop for individual coverage for you and your children. If you will be shopping for individual coverage, I recommend a trusted online health insurance website like Medicoverage.com where the quotes are free and fast and the customer service, if you need it, is top notch. These days, most of what you need is probably available online, such as bank and credit card statements, so what you really need to do is make sure you are aware of all your key asset and their account numbers and – very important—that you have passwords to them all. In some cases, you may need to make actual copies of paper documents (or it may just be easier to do so), such as your tax returns and the title to your house. Thinking through this now, while you are still under the same roof will be a lot easier than trying to gain access later, after a split. Divorce is a dark, difficult, scary, gut-wrenching time. Everyone who goes through it needs help. And you’d be surprised at how happy and honored those of us who have gone through it would be to help you with yours. Whether it is a professional therapist or just a trusted friend or two, make sure you find someone to talk to. Not only can trying to go it alone cause you to make bad financial decisions – some women have been known to spend hours weeping in their divorce attorney’s offices, only to rack up $50,000 or more in lawyers fees – but it can leave you feeling very, very alone. And that is no way to lead a happy, healthy financial life.